Ammunition Capacity: 17 round full size metal magazine. FPS: 380 using .20 gram BB's. 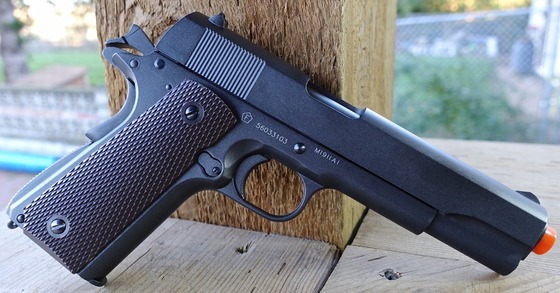 This is a Mini Review for the KWC/Cybergun Colt M1911 A1 CO2 Blowback Airsoft Pistol. I have already reviewed other KWC version of this all metal realistic CO2 blowback pistol in both 6mm Airsoft and 4.5mm Steel BB and in a variety of different finishes so if you are interested in a more detailed write up for the Cybergun Colt M1911 A1, you can check out the below links where I have reviewed many variations of virtually the same blowback CO2 airgun made by KWC. KWC - Cybergun 1911 Style 4.5mm Steel BB & 6mm Airsoft Comparison. Cybergun - KWC Tanfoglio Witness 1911 CO2 BB Gun Field Strip. Cybergun - KWC Tanfoglio Witness 1911 CO2 BB Gun Review. 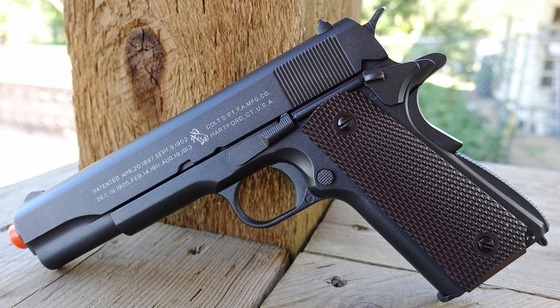 KWC M1911 Model A1 TAC CO2 Blowback BB Pistol Table Top Review. KWC Cybergun P1911 Swiss Arms CO2 Blowback BB Pistol Field Test Review. 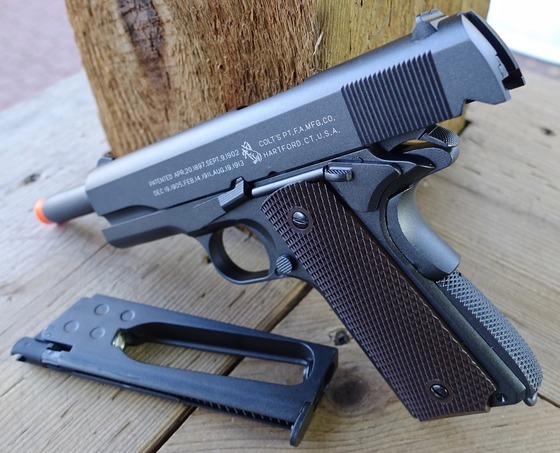 KWC M1911 Model A1 TAC CO2 Blowback BB Pistol Field Test Shooting Review. Cybergun Blackwater BW1911 R2 Blowback BB Pistol Field Test Review. 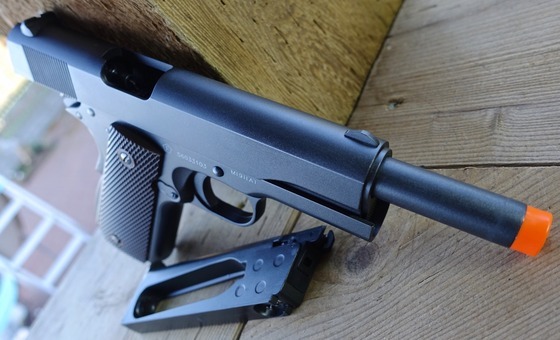 KWC Metal Slide CQBP M45 A1 Non-Blowback CO2 BB Pistol Table Top Review.